Last summer my brother gave me this antique quilt top that one of our cousins gave to him. I had bounded three antique quilts that his mother in law had given to him and he said I could keep this one. So I took on my summer road trip and found some fabric in Colorado for the back and some 30's reproduction print at Missouri Star for the binding. As you can see it had issues. It was very lumpy wavy. I took to Betty Lewis of Louisville, MS and she was able to get it quilted with no tucks!! She had to keep a steam iron handy and steam the fans before quilting to shrink them up. She did a beautiful job. 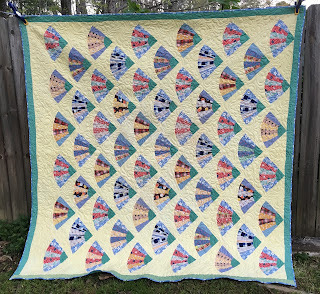 I named the quilt, Summer Breeze. I know that they did not name their quilts in the 40's or 50's when this was made, but I like to give my quilts names. I still need to put labels on some of the other quilts that she made. But this one is done! A couple of weeks ago my daughter called and asked me to make a baby quilt for a couple at her office that does NOT like color. My first thought was how on earth does someone make a baby quilt with out color. 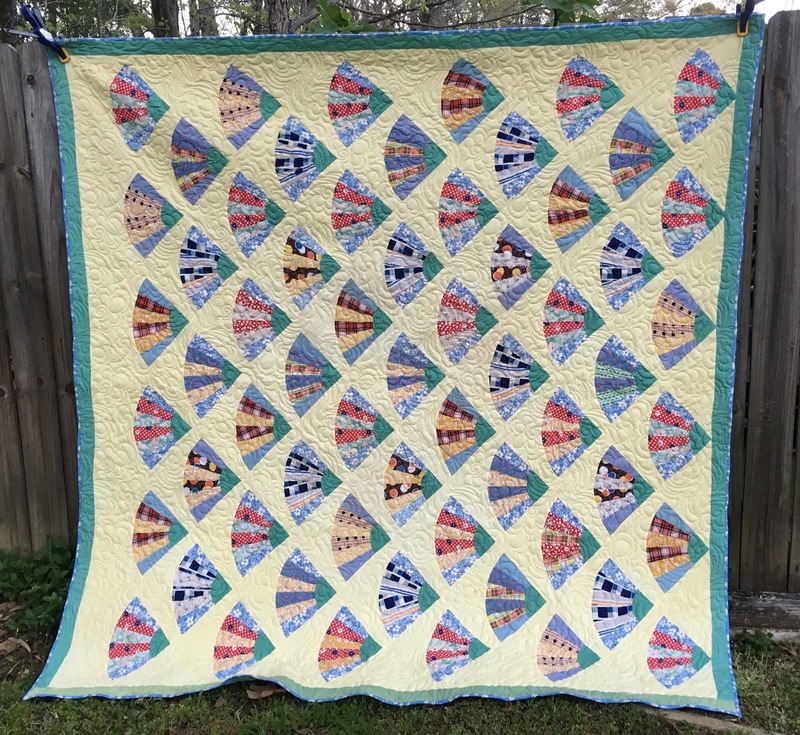 After I thought about it, I went shopping in my stash and I found a neat fabric that I had bought a few years ago to make a stack and whack quilt for my nephew, as I thought he was into zoo animals, then I found out he wasn't so I made a different quilt for him. 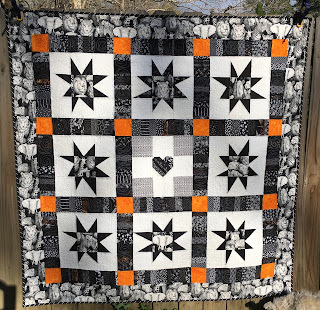 I was originally going to do a stack and whack quilt, but then decided to make a wonky star block with a fussy cut animal from the safari fabric that I had in my stash. There were eight different animals in the print that were suitable for fussy cutting at 5 inch squares. So then I cut 8 white squares for each block and various black fabrics for the wonky star points. 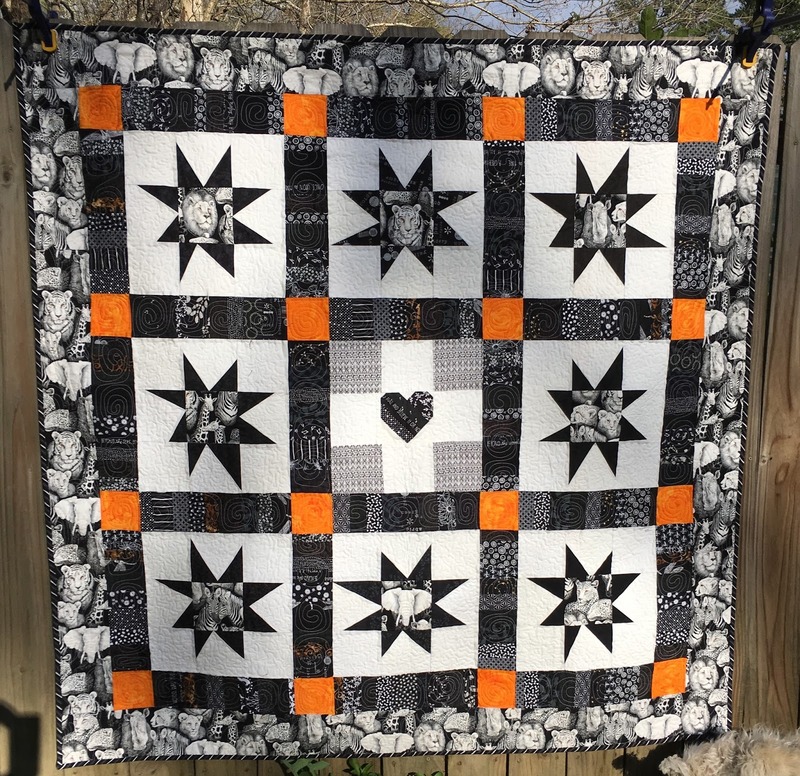 After I made the 8 blocks I was going to make a heart within a star, but it did not look right so I put a black and white print on the four corners. I was originally going to put 2.5 in strips for the sashing and cornerstones, but I sent a photo to my daughter and she thought it should be wider, remember the blocks are finishing at 13.5, so the normal sashing did look a little undersized. I decided to string piece the sashing using my blacks with white prints. I had seen Bonnie Hunter do that with neutrals. That really set everything off and I made them wide enough to finish at 3.5 inches. Decided that it needed a border around the whole thing, so I cut a border out of the safari fabric and used it around the whole thing. That made the quilt finish at 63 inches square. I like that size for a baby quilt, as it is big enough for them to use till late into childhood. I quilted this on the long arm machine at Bernina Sewing Center in Ridgeland, MS. It sure does make that go fast to get something like that quilted in a small period of time. I did have a couple of tucks get in the back as I forgot to attach the side clamps. I guess that is what happens when you only quilt on a long arm once every few months. I whipped stitched the creases down and because that would make them less noticeable. I used the same animal print on the back and it is so busy it does not show at all... but I still hate that it is there. Hope the baby loves it and uses it till he or she is too big for a small quilt. During spring break I went to Mountain Quiltfest with my friend Lauren. We both needed to get away. I am a teacher, so by Spring Break time, I am ready for a break. Lauren is her dad's caregiver, but has recently gotten a little more help on board so that gave her a chance to get away for a little break too. The scenery was wonderful, as was the weather. It was glorious. The red buds were in full bloom and the azaleas were just starting to bloom. I had entered three quilts into the show. Here are the three that I entered. I did not win any ribbons, two of the quilts got dinged on needing to trim threads...I would have sworn I had done that so I will be glad to get them back and check them over! No trip to a quilt show is complete with out shopping...both Lauren and I did our parts to help the economy and the local quilt shops stay in business. I always have some ideas of what quilts I would like to work on in the coming year, and this year I would like to make a row quilt. so I was looking for some red and whites to mix in with my 30's prints. I think it will make a really happy quilt to throw over you when watching TV. Then I saw these great grey neutrals and I just loved the way they played together, and I am usually not one to buy fabric with out an idea of what I want to do with it...as I like to know about how much to get and if you have no project in mind you cannot even guess how much to buy...but these spoke to me so I bought some. All have been washed and are sitting on my coffee table waiting for me to put on the shelf or start to work on the next project...I know they cannot just hang out there for long, but I have been enjoying seeing them there as I finished up a binding on another quilt. I will write about that in a day or so. 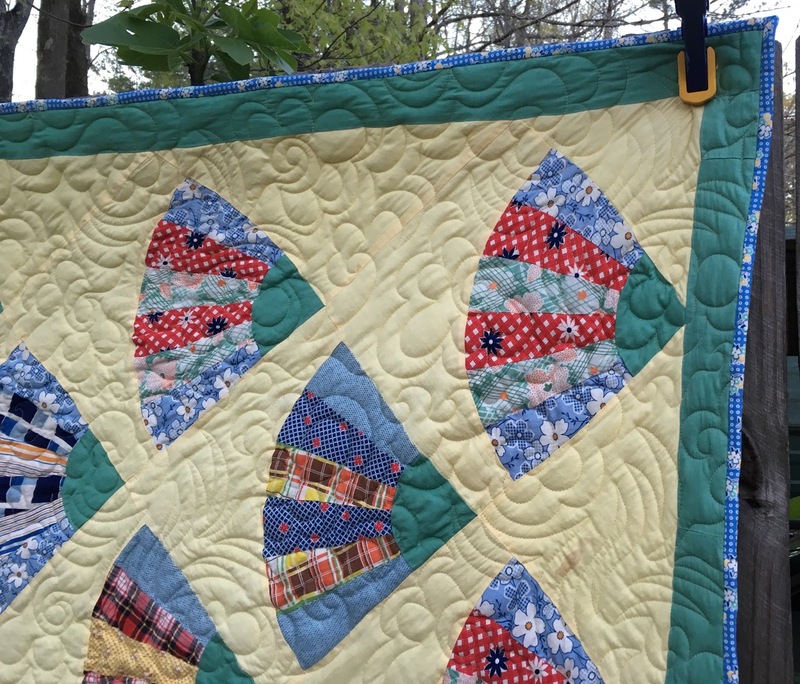 This post is not about quilting... it is about Mississippi politics that affect schools. So if you are just a reader of quilt posts, I promise to be back on my quilting posting game in a few days or maybe a week, as a teacher, this week is 9 week tests and they always take a lot of energy. 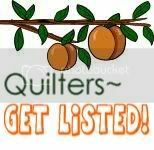 Come back in a few days and check for quilting posts!! Please, Mississippi residents, even if you are not interested in politics read this and think about it as this issue and if you agree with me, click on the link at the end and sign my petition. About two weeks ago it came to light that a bill, that had been in the works for about a year or two was going to come to the floor of the Mississippi Senate. The bill, SB 2495, would combine Winona Separate School District (basically the city of Winona district) with Montgomery County, (the county Winona is located) and Carroll County into one school district. The bill was proposed by the senator from Oxford, Senator Tollison. Talk around town was that it was started by Senator Lydia Chassanoil, from Winona. The bill passed the Senate with no discussion The rationale for this move was that all three high schools are old buildings and need expensive updates. The combined district would, supposedly, build a new high school at the intersection of highway 82 and interstate 55 to serve these three combined districts. There is talk that the owner of Viking stoves would give 7 million for the new school. I have heard estimates ranging from 20 to 30 million would be needed to build a new facility at that location. At this point, I don't think there are any set plans or real estimates of costs so it is all very unsettled. Our high school building in Winona is old and desperately in need of some major updates. Another rationale for the combined school districts was that at one time in our history Montgomery and Carroll Counties were one county. I really don't understand why this is relevant in this day and age, but it was given as a reason to combine. The last reason given was for the combined school districts was that it would build on the economic development happening on the 82 corridor from Winona to Greenwood. I drive that way reasonably often and I have not seen any new building on the drive, except for one new house. First, I am upset that this has been in the works for a year or two and the communities that will be impacted by this have been kept in the dark. If the communities had been brought into the discussion, then they would have time to look at facts and decide if they would like to support or oppose this bill. There would also have been more time for discussion with legislature members. I personally feel betrayed by those elected officials. I drove around and looked at the other two high school campuses today. JZ George, the Carroll County school looks to be fairly new and in good shape from the outside. It does not seem to need a lot of updates. The Montgomery County High School is on a very narrow road and looks to have been built in the 60's or 70's. It looks to be in need of some updating. Both sites seem to be land locked with homes built all around it or ravines that would be very expensive to fill. The other problem is that they are both on one side of the incredibly large district that this consolidation would cause. If they are to build a consolidated high school Winona is the only site that makes sense. Winona City Schools are about 10 miles from Kilmichael, 10 miles from Carrollton and 10 miles from Vaiden. Winona High School is also in a land locked position with no room to expand. So if a combined high school is needed it will have to be built. That will leave three school building to dispose of. The Winona High School was built before the 1940's as my mother graduated from that school during that time frame. It is in declining shape and either needs a major renovation or replacing. But I am concerned about having an abandoned building that size on one of the major streets in Winona. To take it down, would probably cost a pretty penny as I know there is asbestos and most likely lead paint, just by the age of the building. One of drawbacks to this new consolidated school idea, is that one of the reasons Winona is so successful is we have a strong tutoring program. The Winona district is small enough that it is not a big burden for parents to pick up their kids and in a pinch we are close enough for most of our students to walk home. If we build a school out near the truck stop on 82 walking home will not be an option for almost all of our students. If we build a new high school out there, will we have to run busses over the large district for tutoring? What about students getting home from games late? I had a student tell me just a week or two ago, that she was so tired after a late game, that she almost fell asleep while driving home after the bus dropped them off. Now that is a student that has a short drive. What will be the danger when they have to drive 10 plus miles? I have also heard there are some issues between the students from JZ George and Winona. One of my students said the JZ George students were threatening the band students after a football game. Others have told me about fights on the weekend between the two groups. If that violence spills over to school hours that will be challenge to deal with. Another reason for consolidation often given is to save on administrative costs. I don't know if the senators have looked at our districts in depth as the Montgomery superintendent takes a very minimal salary (about what a beginning teacher would make) and the Winona school board takes no salary. I expect the school board situation would change and any saving in administration would be taken up by new transpiration costs. So what to do? I wrote a petition that I am going to send to Governor Phil Bryant. Please consider signing it and help up defeat this bill. In my opinion the legislature is being rather less than open with the public and is picking off the small districts a few at a time, so it is hard to get a coalition together to defeat them. Apparently they did Clay county last time and this time Winona and a few other counties are on this legislative agenda. My understanding they are going to continue in this manner till we are down to 100 or so districts. So who is off the chopping block? My bet is Senator Tollison's home districts and other large districts with lots of political pull. Even if this is not your county, please help up defeat this forced reorganization....The legislature has a one size fits all mentality on this issue and I don't think that is necessarily that best approach. Each consolidation deserves its own consideration as every district has pros and cons to consolidation. One of my Facebook friends said Maryland only has 23 districts and a higher population. They also have one fourth the area that we do. I really think that the more local the control the better for the students.